With so many exhibition products available, it can be hard for businesses to know which solution is worth investing in the most. There are lots of variables to consider when purchasing a display product, including floor space, the type of event and the purpose as to why you are exhibiting. Whilst some products may serve certain variables well, they might not cover all bases. Inflatable event structures are among the handful of products that tick every box when it comes to exhibiting, and for this reason, we firmly believe that if businesses are going to invest money into a product, it should be an inflatable structure. Why choose an inflatable structure? Inflatable advertising products are ideal for large format events as they are much larger and more eye-catching than most other exhibition solutions. However, do not let this deter you if you don’t have much space to exhibit. We have a plentiful amount of products, ranging in size from 2m to 12m. One of the biggest advantages inflatable exhibitions have over other products is that they provide unmatched graphic space. Almost every inch of any inflatable structure is fully customisable, allowing you more freedom to showcase your brand with striking graphics and heightened brand promotion. Such flexibility makes for unrivalled awareness at events, ensuring you attract visitors with ease and style. Versatility is at the heart of inflatables. Providing your floor space allows for it, inflatables can be used both indoors and out, making them ideal for use at a multitude of events regardless of the venue. They are fully weatherproof, giving you extra peace of mind that your exhibition can withstand whatever nature throws at you. We know that many people dread exhibiting because they fear that the assembly of their displays will be tedious and time consuming. Inflatables are so effortless to put up because all they require is to be filled up with air through an electric pump. There is no need for constant airflow; once the structure is blown up it is ready to go. This allows you to get your stand up and running in under ten minutes, leaving you with more time to focus on what really matters; your customers. What inflatable options are available? Here at XL Displays, we are proud to offer the UK’s most comprehensive range of inflatable structures. We are the UK’s official distributor for X GLOO Inflatable Event Tents, which are our bestselling inflatable product, and for good reason. The X GLOO uses German engineering to provide a superior quality event tent that has limitless customisation options. It comes in five sizes, meaning it is ideal for any area or space you might be exhibiting in. With a host of accessories available to add to your X GLOO, you can create a truly stunning and personal exhibition that is guaranteed to market your brand to its best potential. Signus Inflatables comprises of a sleek event tent that is Swedish by design. 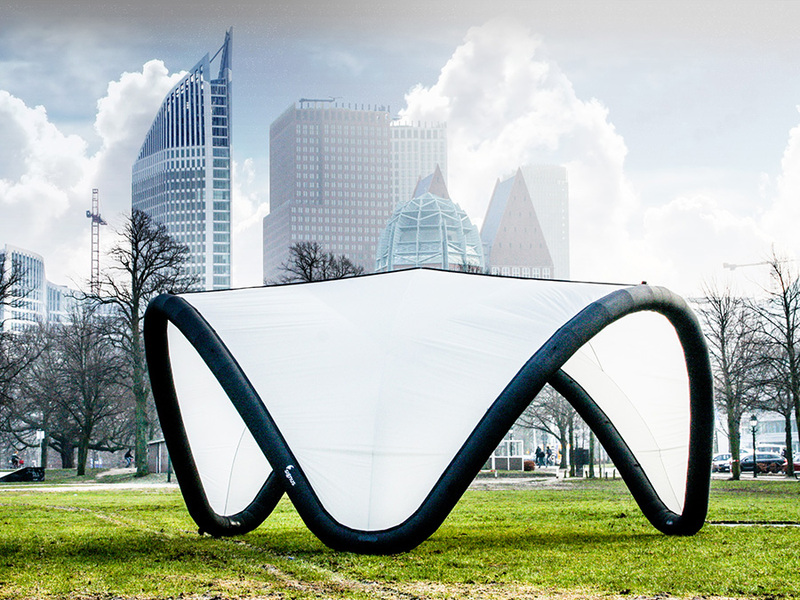 It differs from the X GLOO Inflatable Event Tent based on shape. The X GLOO is based on the shape of an igloo, whereas Signus has three open sides and is comprised of three zip-on pieces of fabric rather than being one whole entity. The unique shape of Signus makes it a contemporary solution to exhibiting. It comes in three sizes and offers reams of design potential. Signus looks round from above, allowing you ultimate freedom when designing your display. If an event tent isn’t quite what you need, an inflatable arch may be the way forward. Ranging in size from 4m to 12m and available in round, rectangular, angled or bespoke shapes, arches provide you with high-velocity brand promotion that will get your name recognised with minimum effort. 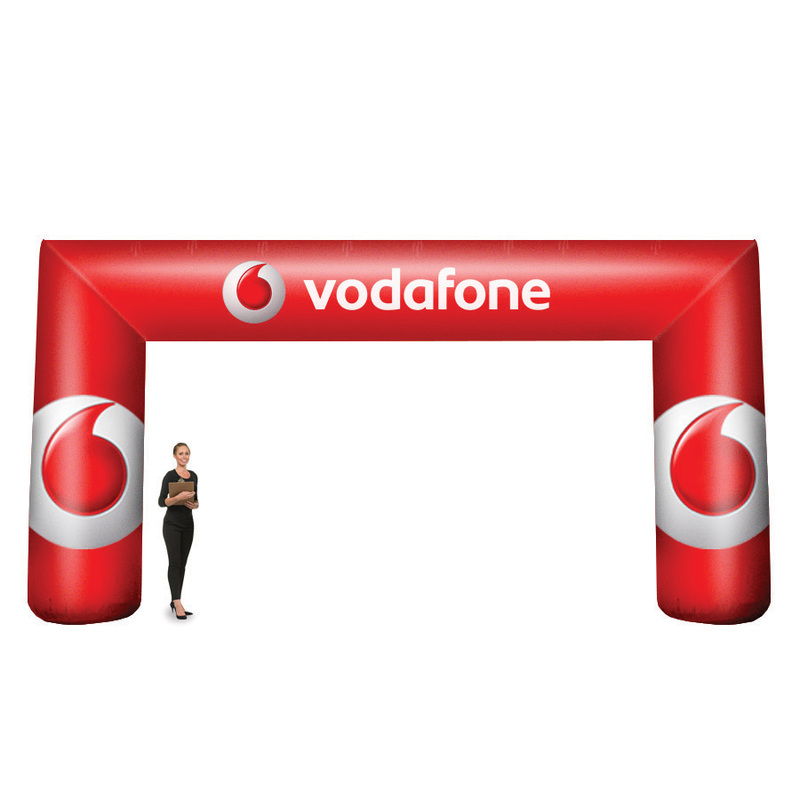 Available with full print, logos or simply plain, arches work particularly well at sporting events and festivals. 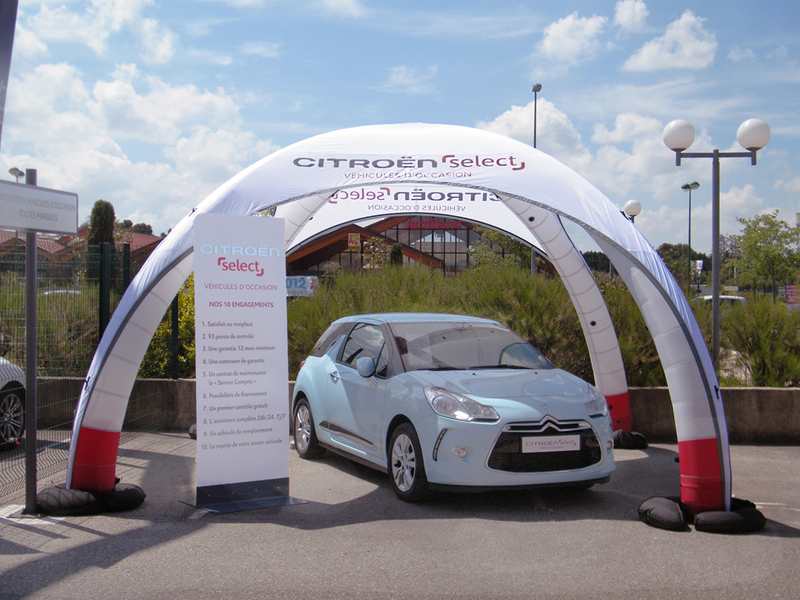 Like our inflatable event tents, inflatable arches do not require constant air flow. They are sealed air units, meaning you simply fill them up once and they’re ready to use. Inflatable columns are ideal for enhancing your brand profile simply and powerfully. Available in either 2m or 3m, there is no clearer and more direct way to advertise your business. An alternative to columns are balloons which are larger in size. 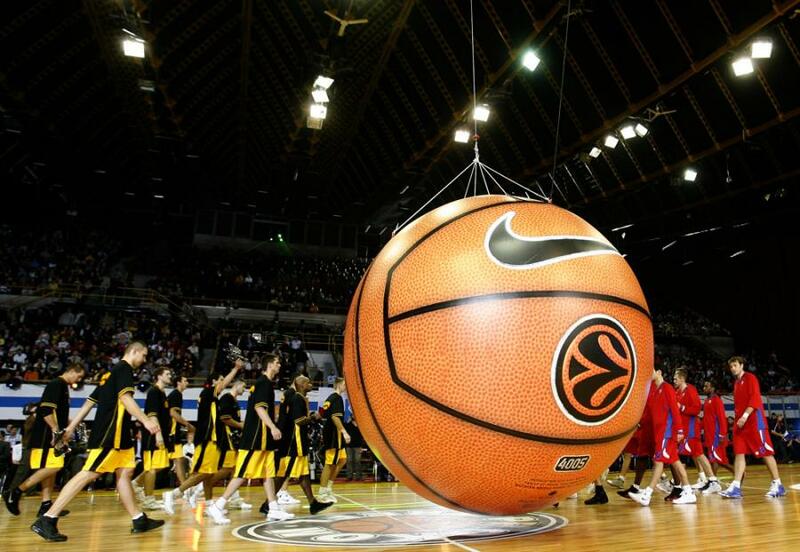 Inflatable balloons range from 4m to 6m, meaning they are perfect for making people aware of your brand. If you require something that isn’t listed on any of the above product pages, we offer bespoke inflatables. Whether it’s an inflatable column, balloon, tent or shaped object, we can provide a solution for you. We can print any Pantone or CYMK colour, which is ideal for brand matching. For more information on our custom bespoke inflatable structures, please get in touch. We know that some events can be long and tiring for both you and your visitors. This is why we supply inflatable furniture that is ideal for making guests feel more comfortable when they are talking to you and finding out about what your business has to offer. Furniture is fully brandable and we offer a wide selection, including sofas, chairs and tables. We use inflatable structures at almost every event we attend – specifically the X GLOO – because of the flexibility and high impact it offers. We always get heightened footfall and increased stand engagement when we use our inflatables, and the great thing is that we can use them time and again because of their durability, effortless portability and easy assembly. To find out more about our selection of inflatable structures and to see how they can benefit your business, don’t hesitate to contact us or call us on 01733 511030.